Drs. 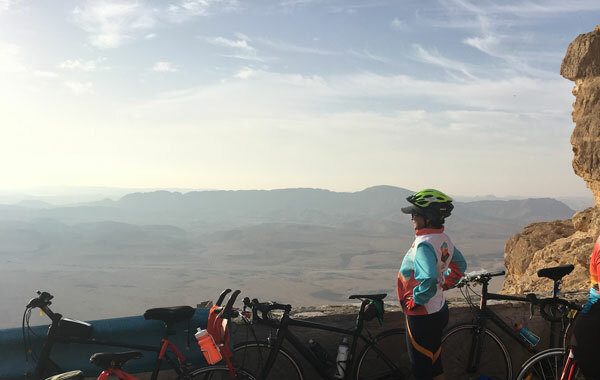 Mark & Pnina Mintz, on behalf of Team CNNH, recently completed an arduous five day journey on their trusty bicycles across the landscapes of Israel (400+ miles combined) to raise funds for NeurAbilities and Arava Institute. Scroll down to view pictures from the trip and to learn about the event and these two worthy organizations. Learn more about Team CNNH past activities HERE… and consider joining the team! We’re always doing fun rides, runs and walks throughout the year! Team CNNH members get a cool CNNH hat and/or CNNH bike jersey. Celebrating the end of the ride at the Red Sea! Dr. Pnina Mintz surveys the Negev desert as she prepares her mind and body for the trip. Dr. Mark Mintz early in the trip. Heading south, greens gave way to rolling desert hills. 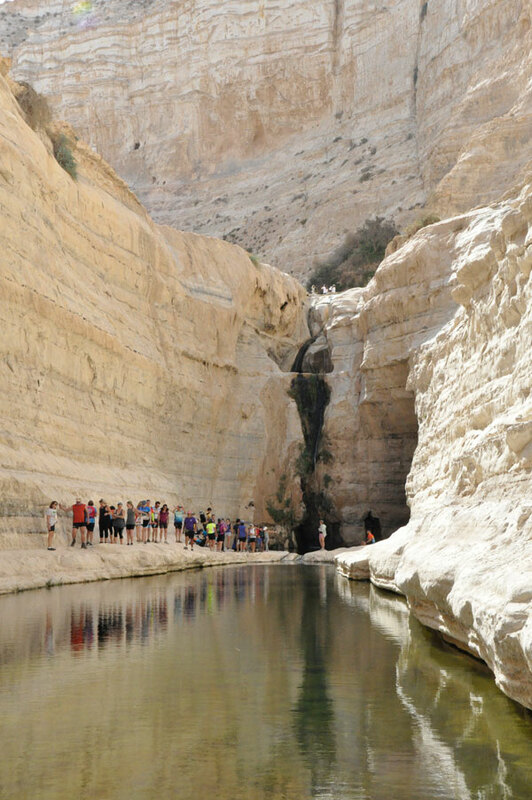 Ein Avdat canyon was one of many exciting sights to be seen along the way. Over the years, Team CNNH has raised tens of thousands of dollars for various worthy charities. 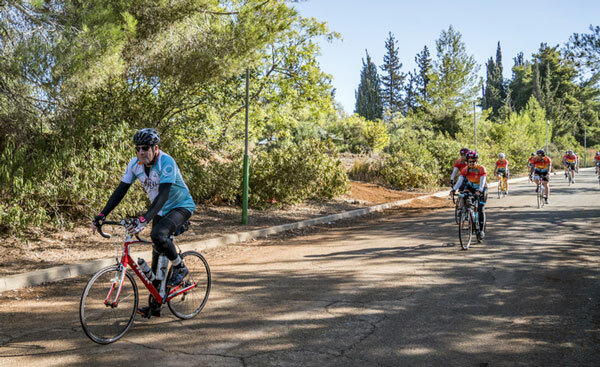 Our goal for the ride is to raise $10,000 with half (50%) going to the Arava Institute of Environmental Studies and the other half locally to NeurAbilities programs. The primary beneficiaries of our fundraising will be the Arava Institute for Environmental Studies (arava.org) and NeurAbilities (neurabilities.org). The Arava Institute for Environmental Studies is one of the leading environmental academic and research institutions in the Middle East. Its mission is to use the world’s environmental resource challenges to build dialogue, cooperation, and trust among Israelis, Palestinians and Jordanians and, in doing so, create a catalyst for peace. NeurAbilities, based locally in Voorhees, New Jersey helps empower special needs communities by increasing their community inclusion, knowledge and supports, and foster independence, self-esteem and artistic expression through creative arts, education and research. Investing in peace and the environment makes sense. Palestine and Israel are on the same side of the Paris Accord. In a world of scarce resources that is hotter and dryer than ever before the lack of water for people and nations will be a constant cause for further conflict. The Middle East, especially the land lived in by the peoples of Jordan, Israel and Palestine – and now more than 1.3 million Syrian refugees – is smaller than the state of New York. If one nation pollutes, they all experience repercussions if wastewater is dumped in the Mediterranean it washes up on the others’ beaches; if water is not available for domestic and agricultural use it will disrupt the lives of their peoples. Much of the land is already a desert, some even hyper-arid receiving less than 1 inch of rain a year. Little grows and what does requires intelligent conservation and sophisticated reuse of water. Sunlight and thus solar power is plentiful for those with the land and know-how to capture it. Rivers and aquifers are shared. There is no escaping the fact that nature knows no borders. Palestinians, Jordanians and Israelis are working together on cross-boundary solutions to environmental problems. Surprised? Well, you might be. The Arava Institute for Environmental Studies located in the south of Israel, largely housed on one of the few remaining traditional kibbutz communities, has been working to educate young leaders from all three of these societies and build trust for twenty years. This has led to cooperative research and development in renewable energy, water conservation, as well as wastewater treatment and reuse and sustainable agricultural innovation. How can a small Institute in the middle of nowhere accomplish this? 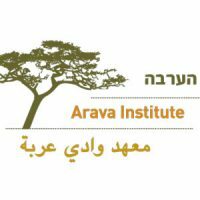 As Margaret Mead famously said, “Never doubt that a small group of thoughtful committed citizens can change the world; indeed, it’s the only thing that ever has.” In fact, the Arava Institute, from its inception was committed to educating and working beyond borders. At the Arava Institute students Jordanians, Palestinians, Israelis and citizens of the world, largely North Americans are actively trained to respect each other by learning about environmental challenges together and by intensive peace-building leadership seminars. 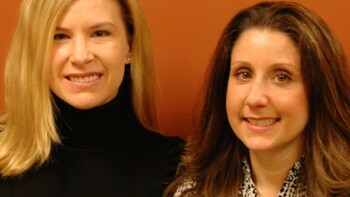 These students are increasingly in positions to make a cooperative future possible. Bottom of Form The Arava Institute is now moving forward to build political solutions to the region’s environmental problems. Last fall representatives from Jordan, Israel and Palestinian entities (some the Institute’s own alumni) came together to look at the issues. Today those partners are in working-groups, focusing on viable cross-border solutions. 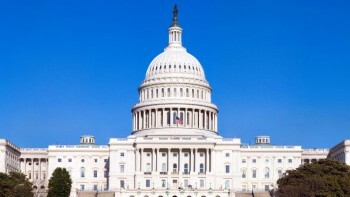 The environment cannot wait for a peace-accord that seems intractable or for environmental accords that all three of these parties are signers of the Paris Accord, even if the United States has now withdrawn its support. Why should we care about the resources of Israel’s neighbors? Beyond Israel’s self-interest in clean beaches and aquifers, Israel is a leader in water reuse and conservation, as well as desalinization, and knows that stable neighbors are an essential element in securing peace; and water and accessible energy are essential for economic, social and political stability. Climate change will have a major impact on an already water-scarce region. Only through cross-border cooperation will the region be able to adapt peacefully to higher temperatures, less rainfall, biodiversity loss and the shift in climate zones. Looking for solutions, as partners on environmental issues, is part of the way forward. If the Arava Institute can make progress then hopefully so can our governments and leaders. We must look forward to building a more peaceful, sustainable and healthy future that will allow for the region to teach about the possibilities of peace and the importance of environmental cooperation today and for our future.